Reformatting a hard drive does not fully erase it, Vinpowerâ€™s HDD Duplicators can perform a secure erase for total security. Often when companies or individuals discard outdated or damaged computers, external HDDâ€™s, or other devices that contain a hard drive (i.e. photocopiers), they will perform a simple reformat function on the hard drive and think that the data has been removed because they can no longer view or retrieve it. In reality, the data was not erased and in the right hands, can easily be retrieved. That means private and confidential information can be recovered from these reformatted hard drives potentially leaving you at risk. There are two ways to securely remove all data to prevent others from recovering this information; One is to physically destroy the hard drive by shredding or puncturing multiple holes into critical areas of the drive. However, this is a waste of a perfectly reusable hard drive, not to mention causes a negative impact on the environment. The second is to use the secure erase function on a Vinpower Digital HDD duplicator, which completely overwrites any trace of data located on the hard drive. 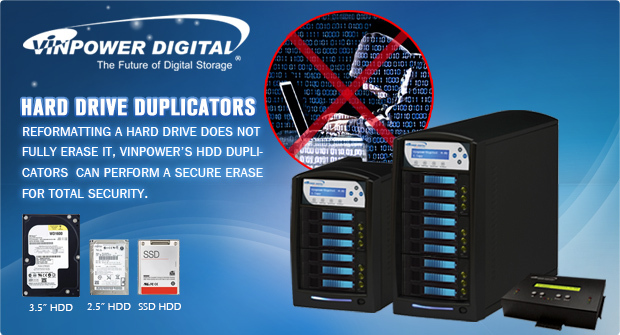 Whether itâ€™s a standard HDD or SSD, Vinpower Digitalâ€™s Hard Drive Duplicator will use a unique feature developed by Vinpower and completely wipe the drive clean, making the data contained on it no longer recoverable. Vinpowerâ€™s secure erase feature is so strong it conforms to the strict DoD 5220 standards. Of course The HDD duplicator can also copy content from one master HDD or SSD onto multiple other HDD or SSD across multiple platforms. 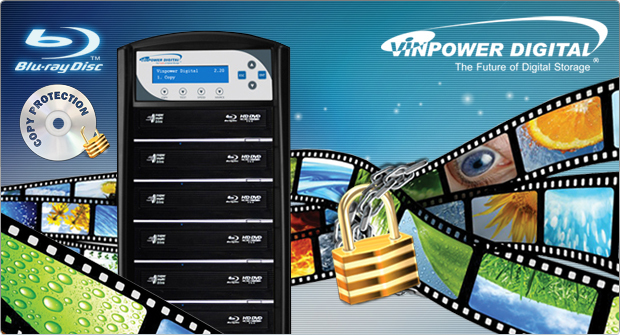 So whether you need to make exact reproductions of a master hard drive content or give yourself peace of mind in knowing that all content stored on a hard drive will be untraceable when performing a secure erase function, the Vinpower Digital HDD Duplicator is the right system for the job. Vinpower will present for the 1st time to those that visit our booth at CES, our latest advancement in the duplication field, Blu-ray Copy Protection. Vinpower has received many requests for an affordable method to implement a copy protection on Blu-ray media, and we have focused to make this feature a possibility to our customers. If youâ€™d like to know more about it or see the application for yourself, visit Vinpowerâ€™s booth (South Hall 1 Booth # 20651) during CES, the week of January 6 â€“ 9th, 2015 for a live presentation.